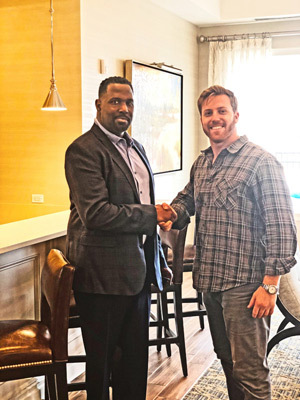 LIVINGSTON, N.J.– When the opportunity arose for Ken Reed to relocate for work, he jumped at the opportunity to find an apartment that truly felt like ‘home’. A Metuchen, New Jersey native, Reed is a longtime professional in the pharmaceutical research industry. He spent several years traveling to different states before buying a townhouse in Parsippany in 2014 to be close to work. When his office relocated from Parsippany to Warren in 2017, he searched for a way to downsize into a one-floor apartment that was close to highways, shopping, and regular hangouts in nearby towns. Reed narrowed down his new neighborhoods to South Orange and Livingston, and eventually chose ParkVue because of its intuitive floor plans. Reed moved into the Bel Air residence, a 1-bedroom, 1-bathroom loft apartment on the third floor of ParkVue’s first building, in April 2017. He said he was happy to be the unit’s first occupant, noting that he has “an appreciation for new construction.” The 1,062-square-foot apartment features a gourmet kitchen with stainless steel appliances, hardwood floors throughout, a walk-in closet in the bedroom, and a sizable den area in addition to the loft. Reed added that the third-floor level and south-facing windows let in welcoming natural sunlight. Accessibility was also important to Reed, who has arthritic knees. As the stairs in his townhome became more difficult to climb the fact that ParkVue’s elevator offers direct access from the underground parking garage, coupled with the apartment’s single-floor design, made everyday living easier for Reed. “I wanted to be all on one floor, and I don’t really need to go into the loft that often, so this layout provided tremendous accessibility and simplified daily life,” Reed said. He added that the apartments are well-insulated, saying that “there seems to be a great amount of soundproofing” at ParkVue. “Once I get into my unit, I don’t hear much of anything – even though I’m in an apartment building, it’s wonderful to feel like I’m in my own cocoon,” Reed said. The community boasts a private clubhouse with a game room, bar, and lounge. Tenants can break a sweat in the cutting-edge fitness center and cool down in the outdoor swimming pool. Afterwards tenants can fire up the BBQ grills for delicious outdoor dining. “The people who live here are very nice – it’s always a pleasure to run into them in the common areas,” Reed said. Five apartments are now available for immediate occupancy in Building 4000, which is currently 85% leased. To tour a furnished unit or learn more about unit availability, please call (973) 251-2454 or visit www.RENTPARKVUE.com. The leasing center is located at 1 Briggs Circle (GPS 211 Eisenhower Parkway) in Livingston. Hours are Monday from 10 a.m. to 6 p.m, Tuesday-Wednesday by appointment, Thursday from 10 a.m. to 8 p.m., Friday – Saturday from 10 a.m. to 6 p.m., and Sunday from 1:00 p.m. to 6 p.m. The exclusive marketing and leasing company is Builder Marketing Services. ParkVue at Livingston celebrates the groundbreaking for the final building (#5000). 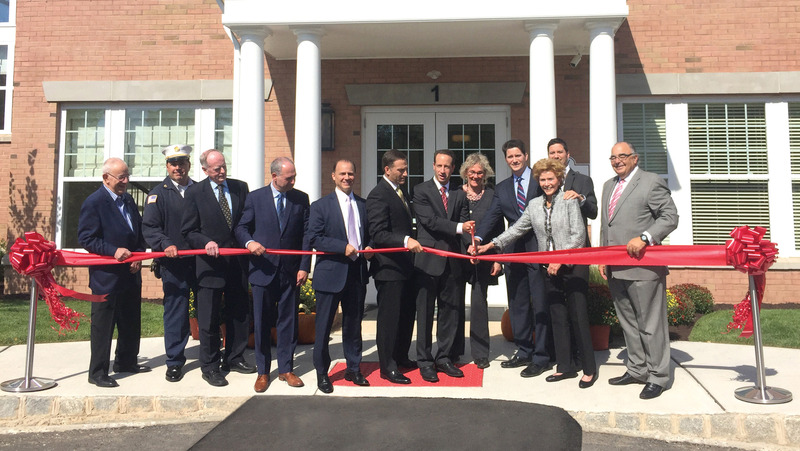 From left to right: Stacey Dratch, ParkVue Property Manager; John Cicchino, Squiretown Properties Owner; Barry Lewis, Jr., Township Manager, Edward Meinhardt, Township Mayor; Mary Ann Cicchino, Squiretown Properties Owner; Steven Cicchino, Squiretown Properties Owner; Sam Gershwin Squiretown Properties Senior Vice President; Martin Casper, ParkVue Service Manager. LIVINGSTON, N.J. April 06, 2018 – When Adam Baranker and Jill Koenigsberg began their search for a two-bedroom apartment last year, they were in search of a community that would feel more like a home than a rental. It didn’t take long to find ParkVue at Livingston, where they were so impressed with the amenities that they wanted to sign the lease on the spot at the brand-new luxury rental community. The couple, who are in their early 30s, chose the Summit model, a 1,257-square-foot, two-bed, two-bath in Building 1000. Adjacent to the living room is a gourmet kitchen with extra-tall cabinets, brand-new stainless-steel appliances and an eat-up bar. The second bedroom serves as a guest bedroom for the couple’s visitors. Wood flooring, spacious closets, and a dramatic transom ceiling are found throughout. The couple chose Livingston because of the township’s proximity to work. Koenigsberg is a kindergarten teacher in Newton, while Baranker is assistant director of Jeff Lake Day Camp, Stanhope, N.J. According to the couple, ParkVue at Livingston incorporates technology in a way which provides modern conveniences other buildings simply didn’t offer. And it’s not just the new appliances and modern architecture: Baranker and Koenigsberg regularly use a smartphone app to safely retrieve packages and mail after hours, a feature which has added great flexibility to their daily routines. Baranker, who lived in Roseland prior to ParkVue, added that the tech details demonstrated ParkVue’s commitment to detail from floor to ceiling. And while it was initially the charm of the apartment that won them over, ParkVue’s communal atmosphere contributed to their happiness in their new home. Baranker and Koenigsberg use ParkVue’s clubhouse, gym and pool. Koenigsberg said she loves that her neighbors know one another and look out for each other’s well-being. Squiretown Properties, the developers of ParkVue, whose family has lived in Livingston for the past 40 years, recently announced that Building 3000 is 70% leased. Immediate occupancies are available. To tour a furnished unit or learn more about unit availability, please call (973) 251-2454 or visit www.RENTPARKVUE.com. The leasing center is located at 1 Briggs Circle (GPS 211 Eisenhower Parkway) in Livingston. Hours at the leasing office are Monday from 10 a.m. to 6 p.m., Tuesday and Wednesday by appointment, Thursday 10 a.m. to 8 p.m., Friday – Saturday from 10 a.m. to 6 p.m., and Sunday from 1 p.m. to 6 p.m. The exclusive marketing and leasing company is Builder Marketing Services. LIVINGSTON, N.J. February 14, 2018 — When it came time to downsize their three-bedroom triplex condominium, Marsha and Richard Larner turned to ParkVue at Livingston – the community they frequently passed while running errands along Eisenhower Parkway in Livingston, N.J.
Marsha, a retired fashion editor and singles event planner, and Richard, a retired nail polish manufacturer and commercial real estate professional, chose The Heritage, a 2-bedroom, 2-bath unit. They moved after living 12 years at the Regency Club in Livingston. 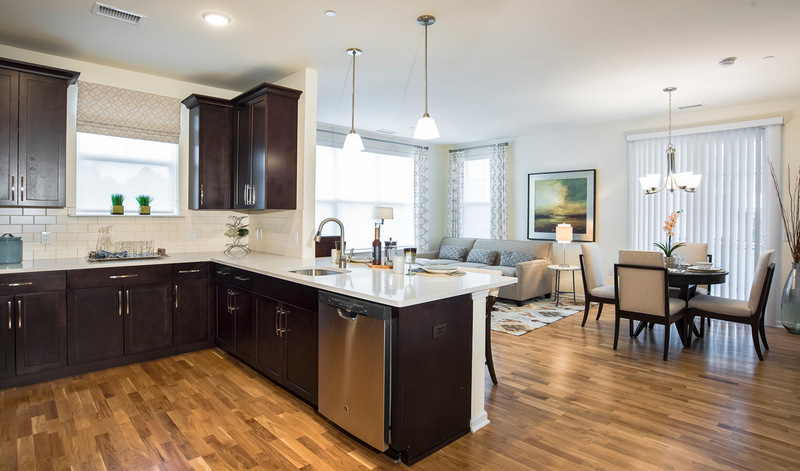 The Heritage features granite countertops, stainless steel appliances, hardwood flooring, an in-unit washer/dryer, and plenty of windows so their new home is always filled with natural sunlight. Faced with increased maintenance costs and breakdowns in their old condo, moving into brand-new construction meant less maintenance for the Larners, as well. Marsha added that a move close by meant that they did not need to find new service providers or change their normal shopping destinations — they’re still just a heartbeat away from the Route 10 commerce corridor. The Larners said the apartment is designed in a way which provides the same amount of space as their old condominium. According to Richard, ParkVue’s attentive management team addresses any maintenance needs quickly, and often without needing to be notified. 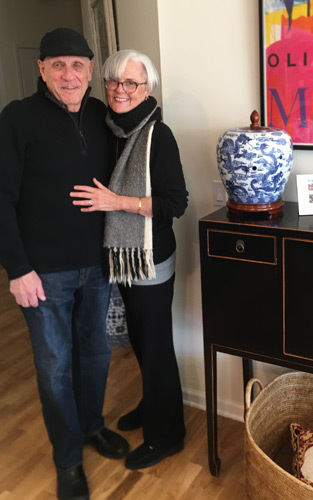 When they’re not spending time in their new apartment, Marsha and Richard can be found taking advantage of ParkVue at Livingston’s many amenities. Richard uses the state-of-the-art fitness center every morning, while the couple attends social events hosted by ParkVue management. And when their granddaughters and great granddaughter come to visit, there’s plenty for them to do as a family: the kids love to swim at the pool and play billiards in the clubhouse. “It’s a pleasure living here,” Richard added. To tour a furnished unit or learn more about unit availability, please call (973) 251-2454 or visit www.RENTPARKVUE.com. The leasing center is located at 1 Briggs Circle (GPS 211 Eisenhower Parkway) in Livingston. Hours at the leasing office are Monday-Wednesday from 10 a.m. to 6 p.m., Thursday from 12 p.m. to 8 p.m., Friday – Saturday from 10 a.m. to 6 p.m., and Sunday from 11 a.m. to 6 p.m. The exclusive marketing and leasing company is Builder Marketing Services. LIVINGSTON, N.J. January 08, 2018 — For Carmie D’Andrea, renting a 1-bedroom apartment at ParkVue at Livingston is the perfect blend of what’s new and what’s familiar. The luxury apartment complex off Eisenhower Parkway in Livingston offered D’Andrea, a Short Hills native and former Morristown resident, a comfortable and safe place to call home without uprooting her professional or social life. ParkVue at Livingston is a brand-new, 220-unit luxury living complex located just off Route 10 and Columbia Turnpike in Livingston. The 1-bedroom and 2-bedroom community, which opened earlier this year, features a Clubhouse and entertainment center with billiards and lounge; a state-of-the-art fitness center; a heated outdoor pool; sports courts; walking trails; and a dedicated barbecue area. D’Andrea said she decided to call ParkVue at Livingston home the moment she stepped foot onto the property, noting its luxury features, her proximity to work and the easy commute to New York City. She was one of the first residents to sign a lease with ParkVue at Livingston. “This was my first and last stop,” D’Andrea said. “The location was perfect and I knew it was a brand-new complex. The second I saw it, I knew I wanted to live here.” D’Andrea selected The Burnett model, a 1-bedroom, 790-square-foot unit in the gated community. Her new apartment – one each of the four styles offered by ParkVue at Livingston — includes 9’ ceilings, a gourmet kitchen with GE stainless steel appliances, an oversized tile shower, a washer/dryer in unit, a private terrace and high-speed WiFi. Lofts are available in some units. “And the service is impeccable. When I email management or maintenance, they return my inquiry within a half-hour,” D’Andrea said. Squiretown Properties, the developers of ParkVue have announced the opening of the new Building 3000 for lease. Occupancy is scheduled for January 2018. The building is now 50% leased. LIVINGSTON, N.J. December 08, 2017 — For some, moving back to the place they grew up means much of the same — the same grocery store, the same scenery, the same people. Not so for Greer Gelman, a Livingston native who moved into the brand-new ParkVue at Livingston luxury apartment community over Labor Day Weekend. 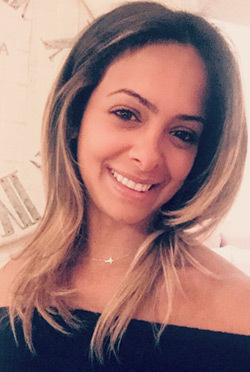 Gelman, who teaches kindergarten at Collins Elementary School in Livingston, spent several years in New York City before returning to her hometown approximately 10 years ago. Since her return, she has been involved in several community endeavors, including a fundraiser for cancer research called Cycle for Survival and admittance to the Livingston High School Hall of Fame. Gelman decided to change developments after renting for nearly a decade at a nearby, older complex. ParkVue at Livingston’s new construction — the complex broke ground in 2015 and first opened to residents this past summer — initially attracted her to the community, and once she saw the amenities she would receive for her rent, she knew that this was the right place for her. The amenities don’t just stop at new, stainless steel appliances. Each 1 and 2-bedroom model features oversized tile showers, a patio/deck off the living/dining room area in most units, a washer/dryer in the unit, walk-in closet and hardwood floors throughout the main living area. Each unit also includes a secure underground parking space, with direct elevator service leading residents directly to their apartments. 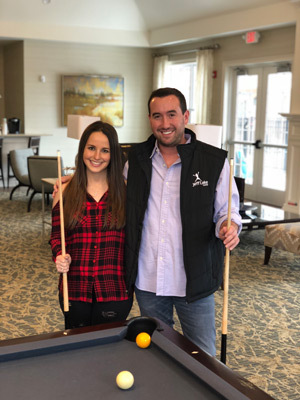 Outside the apartment, Gelman and all the other ParkVue residents have their choice of activities, from a heated pool and sports courts to barbecue areas and Clubhouse, which features billiards and a lounge. Gelman said she gets the most use of the expansive health and fitness center. Aside from all the amenities offered by ParkVue at Livingston, Gelman couldn’t be happier with her neighbors. 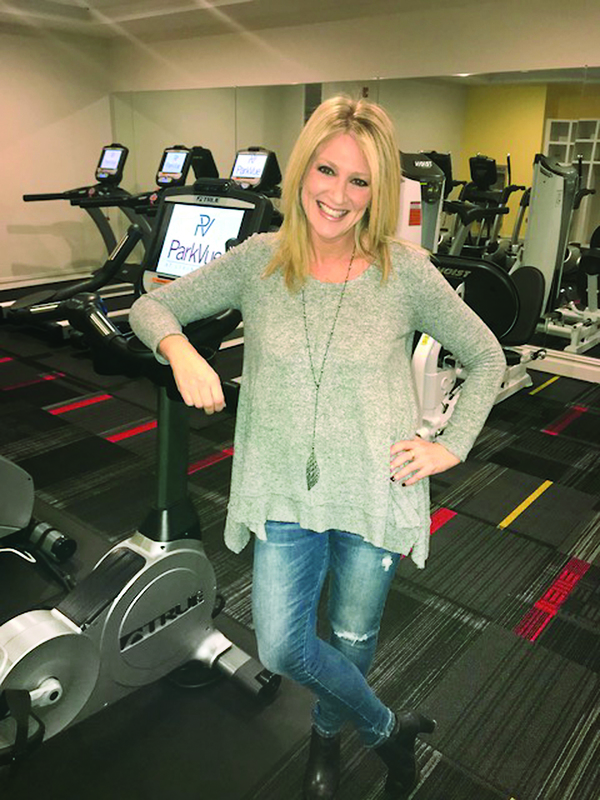 Additionally, Gelman said she was surprised to run into other residents who, like her, grew up in Livingston or were otherwise connected to the township, but all settled on ParkVue as the new and exciting place to live. Squiretown Properties, the developers of ParkVue, whose family has lived in Livingston for the past 40 years, have announced the opening of the new Building 3000 for lease. Occupancy is scheduled for January 2018. The building is now 50% leased. LIVINGSTON, N.J. – ParkVue at Livingston, the brand new and most exciting luxury rental community in the North Jersey area has been in high demand since it opened its doors. The first two buildings were nearly fully leased within weeks of opening; now, new residents looking to join this hot new community can place their reservations for spacious one- and two-bedroom apartments in the new elevatored building. Building 3000 residents can choose from one-bed, one-bath models in two layouts and two-bed, two-bath models in three layouts. Penthouse units include cathedral ceilings with a loft overlooking the main living room. All models include 9 foot ceilings and an abundance of oversized windows providing natural light to every space. “ParkVue at Livingston offers the newest and most desirable amenities to those who want a place that they can meet new people, relax and unwind, and truly feel like they’re at home,” said Eli Montag, Director of Leasing for ParkVue. The newest and most in-demand amenities are among the many features of ParkVue at Livingston. Those who love to cook will find a gourmet kitchen equipped with GE stainless steel appliances, refrigerators with ice makers, a 5-burner gas range, 42” cabinets and stone countertops. Walk-in closets allow plenty of room for your clothes and collectables, while the in-unit full size washer/dryer allows for convenient, any-time laundry without needing to leave the apartment. Each unit includes hardwood floors throughout the main living area and available high-speed fiber optic WiFi. Resident parking includes a secure underground garage parking space at no extra charge; the gated community also boasts video intercom services and parcel deliveries are stored in secure package lockers. Getting to know your neighbors is central to ParkVue at Livingston’s design. The Clubhouse at ParkVue, the on-site entertainment center, is a designer-inspired facility with a bar, lounge and billiards. The community boasts a state-of-the-art fitness center, heated outdoor pool and sports courts to get your heart pumping. Prefer the outdoors? ParkVue at Livingston has walking paths throughout its landscaped grounds, ideal for a simple stroll or a morning run, or to use the outdoor grills for a barbeque. Tucked away off Route 10 and Eisenhower Parkway, the 21-acre ParkVue at Livingston offers an oasis away from the hustle and bustle. The landscaped, semi-secluded property boasts a waterfall and a pond while remaining connected to the surrounding area: the complex is walking distance from major retailers like The Container Store, which recently-opened and restaurants like the drive-thru Starbucks, Shake Shack and Blaze Pizza. Plus there are many local Golf & Country Clubs, too. Commuters to New York City will enjoy a 30-minute trip, while commuters throughout northern New Jersey can easily access interstates 280, 287, 78 and 80. Select one-bedroom units are available for immediate occupancy in building 2000. Reservations for Building 3000 are held for a $500 deposit. To place a reservation, please call (973) 251-2454, visit www.RENTPARKVUE.com, or visit the leasing center, located at 1 Briggs Circle (GPS 211 Eisenhower Parkway) in Livingston. Hours at the leasing office are Monday-Wednesday from 10 a.m. to 6 p.m., Thursday from 12 p.m. to 8 p.m., Friday – Saturday from 10 a.m. to 6 p.m., and Sunday from 11 a.m. to 6 p.m. The exclusive marketing and leasing company is Builder Marketing Services. A ribbon cutting ceremony was held at the 220-unit apartment community, Parkvue at Livingston last Friday. Pictured from the left are: Peter Klein, Planning Board Chairman; Christopher Mullin Fire Chief; Russell Jones, Jr., Acting Township Manager; Edward Meinhardt, Deputy Mayor; Councilmen Alfred Anthony and Michael Silverman; Shawn Klein, mayor; Patricia Sebold, Essex County Freeholder, John, Mary Ann and Steven Cicchino, Squiretown Properties owners; and Sam Gershwin, Squiretown Properties Senior Vice President. Livingston, N.J., September 11, 2017 — It’s easier than ever to imagine yourself at ParkVue at Livingston – Northern New Jersey’s premier rental community — thanks to the fully-furnished, designer-appointed 2-bed, 2-bath model apartment now open for tours and viewing. Designed by the award-winning GB Design Consultants of Verona, N.J., the furnished model is set up in the “Broadlawn,” a 1,239-square-foot corner unit. Beautifully staged with picture-perfect furniture and home décor, the furnished model showcases the entire set of top-of-the-line, in-demand amenities which come with every rental residence in ParkVue at Livingston. Amenity highlights include a gourmet kitchen with GE stainless steel appliances, a gas range, stone countertops, and 42-inch-high cabinets; oversized tile showers; a patio/deck off the living/dining room area; hardwood floors throughout the main living area; a walk-in closet in the master bedroom; an in-unit washer/dryer; and high-speed Wi-Fi. Each unit includes a secure no extra charge underground parking space, accessible through direct elevator service. It’s not just the stellar features of the living spaces that are luxurious – the entire ParkVue at Livingston complex was designed and built with finer things in mind. The smoke-free, pet-friendly community is meticulously landscaped and semi-secluded, with winding roads, walking paths, a waterfall, a pond and terraced walls. In fact, it might be hard for residents to remember that the 21-acre property is actually located just off Route 10 and Eisenhower Parkway, a major thoroughfare just minutes from shopping and recreation, and just under a half-hour from New York City. “Just one step into our community and you’ll immediately know that ParkVue is different,” Montag said. Residents of ParkVue at Livingston are granted access to wide range of activities and amenities without needing to leave the community. A state-of-the-art fitness and health center, including a heated outdoor pool and sports courts, are located right within the community. There’s no need to leave the community for entertainment, either — The Clubhouse at ParkVue is a spectacularly-designed facility which features billiards, a bar and lounge area, and free Wi-Fi. The community also contains a playground, barbecue and picnic area, offering family-friendly fun activities in good weather. According to Sam Gershwin, Sr. Vice President of Squiretown Properties, the developers of ParkVue, security was a top priority. Each apartment is wired for video intercom security, a gated entrance and secured parcel package delivery. The apartments are also serviced through 24-hour maintenance and have generator backup if there’s power failure in bad weather. Building 2 is now 85% leased but there are several units still available for immediate occupancy. Reservations are now being accepted for Building 3, which will be ready for occupancy in January. To visit the leasing center and tour the furnished unit, please call (973) 251-2454 or visit www.RENTPARKVUE.com. The leasing center is located at 1 Briggs Circle (GPS 211 Eisenhower Parkway) in Livingston. Hours at the leasing office are Monday-Wednesday from 10 a.m. to 6 p.m., Thursday from 12 p.m. to 8 p.m., Friday – Saturday from 10 a.m. to 6 p.m., and Sunday from 11 a.m. to 6 p.m. The exclusive marketing and leasing company is Builder Marketing Services. Livingston, NJ, July 10, 2017 – It’s been hailed as one of the most desirable rental communities ever to open in Livingston, New Jersey. And it’s certainly living up to its reputation. The first building of this spectacular 220-unit community was fully leased in just weeks. Building 2, which was offered to the public only six weeks ago, is now 75% leased. So what makes ParkVue at Livingston so attractive? The 21-acre site located on Eisenhower Parkway and Rt. 10 is only minutes from countless shopping and recreation. It is 5 minutes from I-280 and 29 minutes from the heart of NYC. Residents will appreciate the secluded nature of the wooded site that features winding roads and attractive landscaping elements including a waterfall, pond and terraced walls. “It’s the perfect combination of designer-inspired apartments coupled with our enormous wealth of amenities and community features that make it extremely desirable. If you deliver this type of product with a country club lifestyle at a reasonable price, then you have a winning combination,” adds Montag. Developed by Squiretown Properties, ParkVue offers a distinctive collection of spacious one- and two-bedroom model apartments with lofts available on top floor units. Modern luxury living is abundant throughout the residences, including gourmet kitchens, GE stainless steel appliances, stone countertops, 9’ high ceilings, oversized tile showers, spacious walk-in closets, full-sized washer/dryers, hardwood floors in the living areas and high-speed internet. Each building features underground parking with elevator access to residence levels. The luxurious lifestyle offered by ParkVue’s community amenities complete with a full suite of indoor and outdoor amenities are unrivaled in the marketplace. Residents have access to a state-of-the-art health and fitness center, heated outdoor pool, sports court and walking paths. For socializing, The Clubhouse at ParkVue, a striking entertainment attraction for residents, is a spectacularly designed facility that boasts billiards and a bar and lounge area with free wifi. Outdoors, off the plaza level, there is a barbecue and picnic area and playground. The community is also smoke-free and pet-friendly. Security was a top priority for the developers, with video intercom security in each apartment, a generator backup system, 24/7 maintenance, underground parking, a gated entrance, and secured parcel package delivery. Building 2000 at ParkVue at Livingston is now available with occupancy scheduled for August. Reservations are now being accepted for Building 3000,which will be available for occupancy in the fall. For more information on ParkVue at Livingston or to schedule an appointment for a tour, please call (973) 251-2454 or visit www.RENTPARKVUE.com. The leasing center is located at 211 Eisenhower Parkway in Livingston is open Monday-Wednesday from 10am to 6pm, Thursday from 12pm to 8pm, Friday – Saturday from 10am to 6pm, Sunday from 11am to 6pm. The exclusive marketing and leasing company is Builder Marketing Services. 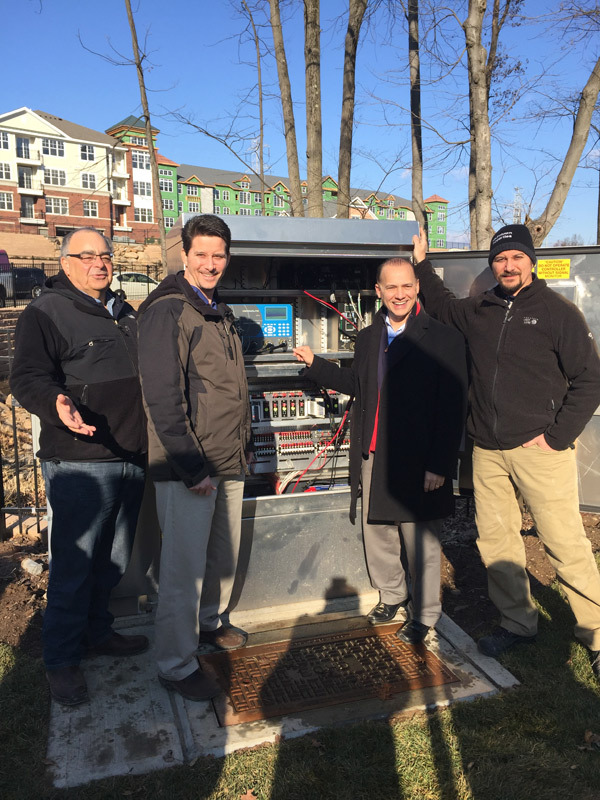 A “flip the switch” ceremony to activate a new traffic light at 211 Eisenhower Parkway was held on Wednesday morning, December 14. The light was installed to provide a safe way for drivers to enter and exit the new ParkVue at Livingston luxury rental community development. The rental community is being developed by Squiretown Properties, LLC. Shown at the ceremony are Sam Gershwin, construction/development director of Squiretown Properties; John Cicchino, co-owner of Squiretown Properties; mayor Al Anthony, and Steve Cicchino, co-owner Squiretown Properties. ParkVue’s rental office is scheduled to open in January. 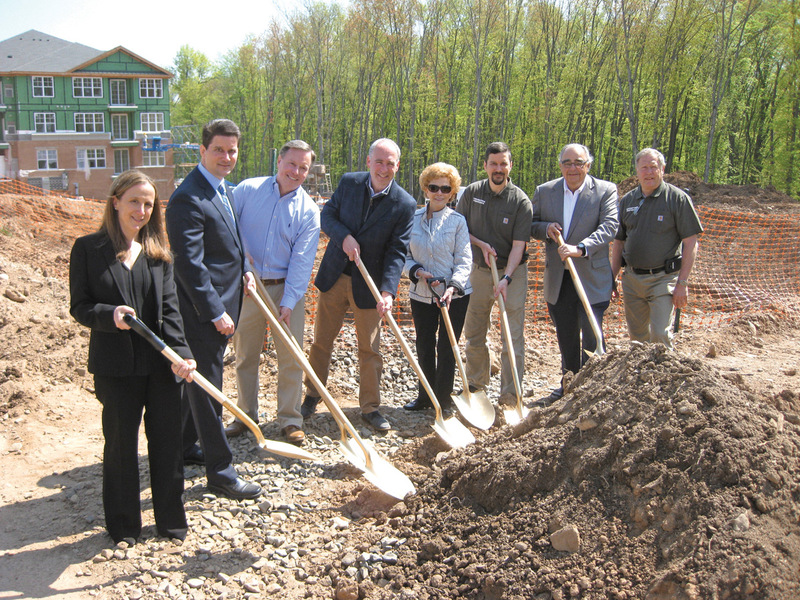 Excitement is building at ParkVue at Livingston, New Jersey’s newest luxury rental community. 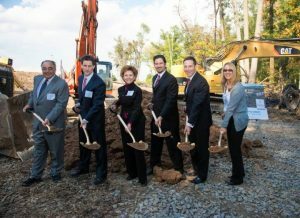 The principals of Squiretown Properties were recently joined by Livingston Mayor Michael M. Silverman and township officials to celebrate the groundbreaking for ParkVue at Livingston, a 220-unit luxury rental apartment community. The opening is slated for the fall of 2016, according to Sam Gershwin, senior vice president of the Roseland-based Squiretown Properties. Ideally situated on 21 acres at 211 Eisenhower Parkway, just south of the intersection of Route 10 in Livingston, ParkVue when completed, will consist of 63 one-bedroom and 113 two-bedroom market rate units, as well as 44 affordable units as determined by COAH guidelines. Beyond the winding road and gatehouse, the site is located on spacious open grounds with wooded buffers. Residents will enjoy attractive landscaping elements including a waterfall, pond and terraced walls. There will be a private clubhouse, heated outdoor pool, multi-use sports court, a putting green and a top-tier fitness center. “We’ve raised the bar above the norm to make tenants feel at home,” added Gershwin. “There will be BBQ facilities, a “tot lot” for residents’ children, a central courtyard with benches, bicycle racks and a walking path. Plus those extra conveniences that tenants expect but rarely get — like indoor reserved parking and available private storage. “ParkVue at Livingston is designed with a community feel in mind — a place where residents and their guests can meet and greet, and enjoy a wide range of indoor and outdoor activities,” said Gershwin. “Its excellent location and provides a great opportunity to create a dynamic residential community, one that is welcoming for a wide demographic ranging from well-established families to millennials. Designed by the award-winning Minno & Wasko Architects & Planners, ParkVue at Livingston will consist of three- and four-story elevator-accessed buildings with brick facades over secure, in-building parking. The marketing and leasing company is Builder Marketing Services. Construction financing is being provided by Valley National Bank. Located in northern New Jersey’s Essex County, the Township of Livingston has an affluent population of nearly 30,000 and is well-known for its nationally recognized school system and strong demographics. Prospective tenants are urged to visit online for VIP registration and construction updates. For a sneak peek, visit www.RentParkvue.com.